Hair Toppers for Women: Should I Get a Top Piece? 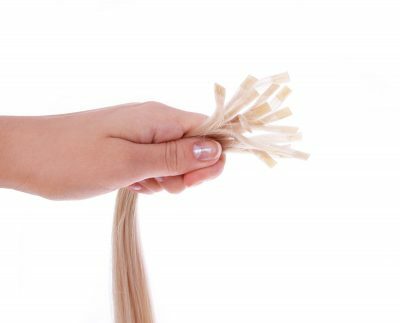 Are Hair Extensions Safe to Wear? Most people want to get as much wear as possible out of their hair extensions. While different types are held in place using different methods, they all have one thing in common. They require a good care regimen to give you the best look for the longest length of time. What can you do to maintain luxurious locks that you didn’t grow naturally? Brush your hair extensions two to three times a day or as needed to keep them untangled and looking great. Remember to be gentle when brushing over or near the bonds. You don’t want to brush too hard and cause them to weaken or pull against your scalp. Salty or chlorinated water is just as hard on extensions as it is on your natural strands. If possible, avoid contact completely. Chlorine and salt can cause knots and matting. The best option is to avoid getting your head wet. If you do go in the water, put on a swim cap or take time to carefully brush out extensions and dry the bonds as soon as you get out. Hydrate your hair and extensions after spending time in the water or under the sun by conditioning. Your stylist can recommend the best product for you. This will prevent damage and keep hair manageable. Each time you wash your hair, natural oils are removed that have to be replenished. Your hair extensions do not get oils from your scalp like your real strands do. That’s why you should avoid over-washing. If possible, try using a dry shampoo to keep your hair looking clean and smelling fresh. You may know that excessive heat from mechanical tools can hurt your natural hair. The same goes for your extensions. Always use curling irons, straighteners, and other tools as infrequently as possible and only as recommended by the manufacturer. Never leave heat on your hair for longer than the instructions or your stylist advise you to. Hydrating oils and leave-in conditioners can be beneficial for your hair. Just remember to avoid applying them directly to the bond. They should be added starting at mid-shaft and down to the ends. This will give you good coverage without affecting the strength of your hair extension bonds. Do not use anything that puts your hair through a chemical process. Products meant to chemically lighten natural hair color, straighten curls, or create weaves can cause damage. Damaged extensions will be much harder to manage along with your real locks. If you wash your hair before bed, make sure it is completely dry before you go to sleep. Brush out all tangles. It can also help to braid hair or put it up in a comfortable ponytail for the night. You can also opt for a sleeping cap or scarf wrapped around your head to provide additional protection from frizz and tugging. It is important to know what type of hair extensions you have when deciding on a care regimen. While these tips provide general advice, you should adjust as recommended based on the needs of your extensions. For example, synthetic hair can become dull and could melt under too much heat. Clip-ins are designed to be temporary and should be washed and styled less often. Know what your extension needs to get the best results. Your hairstylist is your biggest ally when putting in and wearing hair extensions. They can recommend the right type to wear, provide instructions on proper care, and offer services to keep your strands looking beautiful. Contact Tiffany Taylor today to learn more about the best hair extensions for your signature look. INVEST IN YOU. BOOK A SEATING TODAY. A top-rated Dallas hair extension salon that provides clients with the ultimate hair experience. Full-service hair color, cuts, extensions, and hair replacement offerings. © 2019 Tiffany Taylor Hair. All Rights Reserved.